Detection of invertebrate community change in mine-influenced streams using quantitative sampling. Recent studies associating declines in biotic condition of streams with elevated dissolved solids from surface mining in the Central Appalachian coalfields have typically employed established multimetric indices (MMI; e.g. 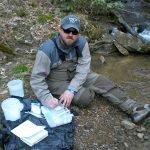 Virginia Stream Condition Index, West Virginia Stream Condition Index, Genus Level Index of Most Probable Stream Status), using benthic macroinvertebrates to assess stream condition. As part of the protocols for generating MMIs, researchers use semi-quantitative sampling methods (e.g. D-nets and kick nets). The calculated index metrics derived from semi-quantitative protocols cannot reliably include population densities per unit-area of stream bottom. In our current study, we are using Hess samplers to quantitatively assess benthic macroinvertebrate community structure in mining-influenced and reference streams. The objective is to determine how macroinvertebrate taxa densities can be used to detect altered stream condition of coalfield streams, with salinity as the primary explanatory variable. Results of this approach from three reference and nine test streams in the Central Appalachian coalfields will be presented.